The Tinley Beverage Company Inc (CSE: TNY) has finally had its turn for the November cannabis sector rush. Although it didn’t post massive gains like some stocks did (see $MYM for this), it certainly saw strong daily gains. 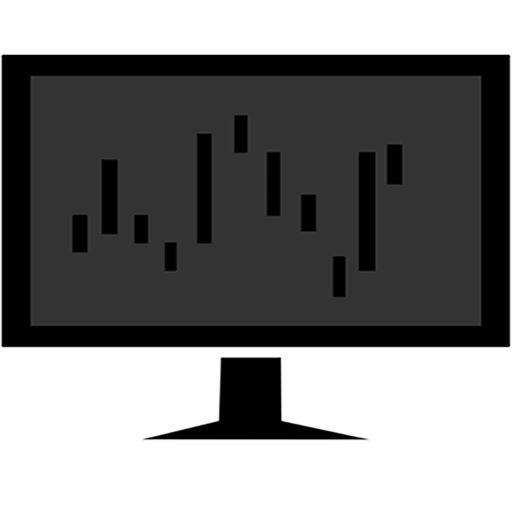 As a matter of fact, today it experienced its highest closing price since being listed on the Canadian Securities Exchange. In honor of this achievement, lets take a look at a few bullet points on the company to get investors up to speed. Unlike the vast majority of companies in the Cannabis sector, Tinley Beverage Co is a company that is flush with reserves. As of its June 30th, 2017 interim financial statements, the company had just under $4,000,000 in cash. Furthermore, by the time all assets are considered, Tinley is just shy of $4.3M. Even more impressive, is its lack of liabilities. In total, the company owes $169,125 in payables. This is unheard of for this industry at this stage in the game. 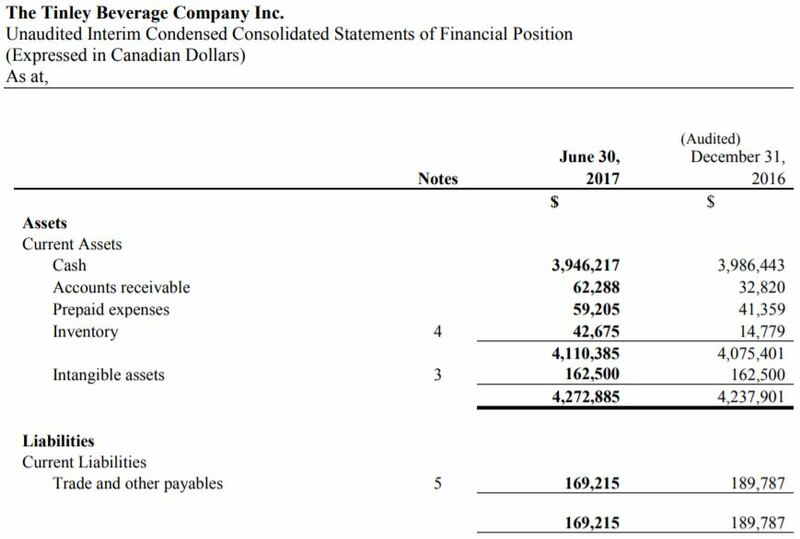 Snapshot from Tinley Beverage Co’s June 30th 2017 interim financials, displaying its hordes of cash. If nothing else, this is a company that likes to keep a clean balance sheet. Assets decreased approximately $50,000 from the previous six month period, which should be noted as well. This is due to a slight decrease of cash, mixed with an increase in inventory, prepaid expenses, and accounts receivable. 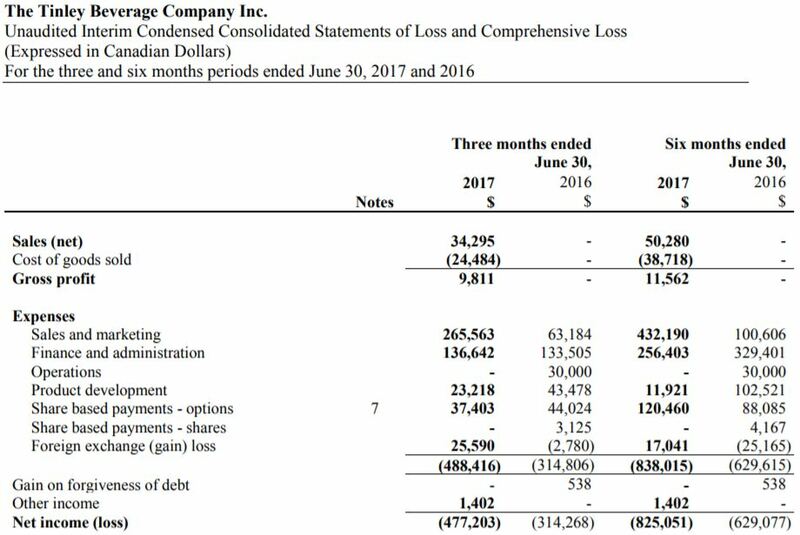 However, it also needs to be noted that the company posted a comprehensive lost of $484,642 during this three month period. It’s cash position was able to stay relatively unchanged as a result of proceeds from options and warrants exercised during the quarter. The company may be flush with cash, but don’t let that fool you – sales are nearly non existent. During the three month reporting period, the company recorded a dismal $34,295 in net sales, for a gross profit of $9,811. Things are just as gloomy for the six month reporting period – net sales of only $50,280 were recorded. Even worse, is the fact that the gross profit is hardly changed from that of the three month period, at $11,562. Sales for the quarter ending June 30th, 2017 for Tinley Beverage Co.
Perhaps the most disheartening aspect of these sales, is the amount of cash spent on sales and marketing to achieve these results. As it stands, Tinley Beverage Co is running at a ratio of approximately $8 in sales and marketing for every $1 achieved in sales. Continuing at this rate is unacceptable. The company needs to place a heavier emphasis on sales in order to continue operations. To this end, the company appears to be making progress. In its October 25th, 2017 operational update, it placed a heavy emphasis on its new retail placement. The placement consists of shelf space in a 14-store premium grocer. In addition to this, it also announced a placement in Texas, which will expand the brand recognition of the company. However, this may not be enough to significantly ramp up its current sales figures. As its stands, the company is heavily committed to expansion in the Californian market. This market, the company estimates, is worth approximately $2.7 billion annually in medical cannabis alone. To this end, the company is making progress. As was previously stated, it just signed an agreement for placement with a 14 store chain grocer. This grocer is known to sell other CBD related goods, so it appears to be a good fit for the company. In addition to sales in the market, the company is looking to increase its operational presence in California. It is currently in negotiations to lease a bottling facility in Southern California. This facility will be able to process up to 15 million bottles per year. As a result of this size, it will be able to incorporate an additional revenue stream to the company in the area of manufacturing, filling unused space in the facility. Tinley Beverage Co’s October 25, 2017 news release referencing its proposed bottling facility. Additionally, there is the Tinley Collective. This is a corporation that is owned by the company. 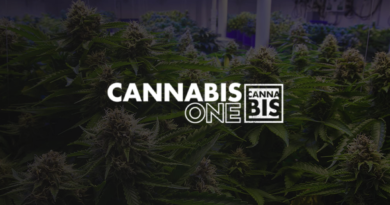 The purpose behind it is to assist individuals with gaining access to the medical cannabis available in the state. It assists individuals with the procurement of medical cannabis. This aspect of the business is beneficial in that it also generates goodwill for the organization, creating consumers that will be more likely to purchase their products as a result of their experience with the company. Finally, is Hemplify, the companies main source of revenue. As most are aware, the Santa Monica, CA based subsidiary is focused around creating CBD and cannabis infused beverages. It hosts an ever growing line of products to suit this niche market. The company plans to also expand product distribution for these lines to other states, as well as Canada once the legislation is enacted. For most investors, Tinley Beverage Company is a bit of a wild card pick. It has an excellent business focus being centered in the niche market of cannabis infused beverages. Its a product that has many benefits to it, and should do well once the normalization of cannabis products occurs. However, they need to step up their sales and marketing for their products. Having cash reserves is excellent, so long as they are not blown through at a horrendous rate. The interim financials due out at the end of November will give a better insight to the growth of this company. With the recent mega deal between Constellation Brands and Canopy Growth Corp that was reported on across North America, the company may see a surge in sales as normalization occurs. Tinley Beverage Co may self identify as a start up, but that doesn’t give it a pass for lackluster sales. If growth fails to occur, its future may be written in the sand. Read the financials. Learn the meaning behind the numbers. Dive Deep. Information for this briefing was found via Sedar and the CSE. The author has no securities or affiliations related to this organization. Not a recommendation to buy or sell.